"We're the first ones to reach Japan, and we'll all be rich if we keep our wits!" One of the most famous mini-series in television history, Shogun tells the epic tale of an English ship's pilot who is washed up on the shores of Japan in the 16th century and becomes embroiled in the political machinations of its rulers. Both educational in its realistic depiction of ancient Japanese culture and dramatic in its swirling confluence of events and personalities, Shogun is an amazing piece of television. Legendary stories abound of how many people stayed home to watch the series, leaving restaurants and movies theaters empty. The series is really quite enjoyable watching. There was an amount of controversy over the choice to not provide subtitles for the Japanese spoken. We, as the audience, are intended to be as bewildered as Blackthorne and as apprehensive in such an alien environment. Generally, illustration, context, or direct translation in the dialogue provides information about what is said. The elaborate translation scenes involving Blackthorne, Mariko and various Japanese figures mostly work, but they are cumbersome at times. There are relatively few scenes when one is pulled out of the drama of the moment by an obviously contrived sequence to communicate what has been said in Japanese. The story is a complex plot that captures a shifting political position in Japanese government with the country dangerously divided between two powerful forces. Lord Toranaga, a member of the ruling Council of Regents, sees that the technology and abilities of Blackthorne will be useful for him in his efforts to out maneuver his opponents in achieving the title of Shogun, military ruler of Japan. Blackthorne and his crew are not the first Westerners to arrive in Japan and they must be wary of Portuguese Jesuits who have lived on the islands. The religious order has built up a profitable trading monopoly and the presence of the cunning "pirate" Blackthorne, as an Englishman, is an enemy both to Portugal and the Catholic Church, and endangers their profits and their power. Rising to a status of trusted aide, circumstances throw Blackthorne together with a beautiful noble lady, Mariko, who is a female samurai converted to Christianity. Blackthorne endures many conflicts as his love grows for Mariko while he continues to pursue his goals of regaining his ship, saving his crew and taking "the Japans" for all the riches he can get. As he moves among the Japanese as an honored guest, he gains appreciation for the samurai way of life, although aspects of it repulse his Western sensibilities. Blackthorne is opposed by the Jesuits, especially Father Alvito (Damien Thomas) and in his struggles with the Portuguese he must deal with the shifting loyalties of Vasco Rogrigues, played by John Rhys-Davies in memorable style. Ultimately, all are pieces in the grand chess game of power and politics that is to decide who control Japan and its riches. A well-respected television actor, Richard Chamberlain soon became regarded as the king of mini-series following his popular performances in Shogun and later in The Thorn Birds. His Golden Globe- and Emmy-nominated portrayal of Pilot Major John Blackthorne is consistent throughout and, in many ways, his performance makes the film watchable. Much of the film is told through Blackthorne's reactions to the incredible sights he sees before him. Chamberlain does a good job in the scenes where he is forced to act with himself for our benefit or work his way through long torturous translated discussion scenes. In these, he is aided both by the character Mariko, and the lovely actress, Yoko Shimada, who plays her. Besides his appearances in legendary Kurosawa films such as Seven Samurai, Rashomon, and Yojimbo and a legendary career, actor Toshiro Mifune has also appeared in English-language films before. He portrayed a racing team owner in Grand Prix by John Frankenheimer in 1966. In 1971's Red Sun, acting with Charles Bronson and Ursula Andress, Mifune portrayed a samurai who is forced to track criminals who stole a sacred sword. Mifune also had a small part in 1979's Winter Kills and a cameo role in Steven Spielberg's comedy, 1941. Shogun received multiple Emmy nominations in the category of Limited Series or a Special including those for sound editing, art direction, cinematography for Andre Lazlos, directing for Jerry London, film editing, lead actor for Toshiro Mifune and Richard Chamberlain, lead actress for Yoko Shimada, supporting actor for John Rhys-Davies and Yuki Meguro, and writing for Eric Bercovici. Image Transfer Review: The full-frame video transfer is consistently fine over the entire nine hours of the program. The show does not completely shake off the "television-ness" of the mini-series, but this is not usually a problem. Over the length of the program, the spareness of the sets reveal more about the production than the quality of the video. Shogun represents a fantastic job in the cinematography, and the transfer here shows it off appropriately. Audio Transfer Review: Two tracks are available for Shogun, a reprocessed Dolby 5.1 surround track and a restored mono version. Both are serviceable and there are a few nice moments in the surrounds. The music generally avoids tinniness, despite the fact that the Japanese-influenced soundtrack by Maurice Jarre could lend itself to it. The monural track is quite fine and is as good as any from the era. Both tracks survive the long experience of watching the film. Extras Review: Shogun features a beautifully illustrated fold-out package and some very good extras that both enhance enjoyment of the film and provide further information about the context of the film. The Making of Shogun (01h:19m:24s): A very good and exhaustive documentary describing how the mini-series came about and some of the difficulties in realizing the novel for television. Includes behinds-the-scenes photos, clips, and interviews with many of the principals. There are some very interesting anecdotes of interacting with Japanese acting legend Toshira Mifune. Other topics include the novel, the cast, the Japanese actors, the cultures, controversies, and more. Commentary by director Jerry London on select scenes: The director of Shogun provides some nice anecdotal information about the series in adding commentary to seven short scenes. 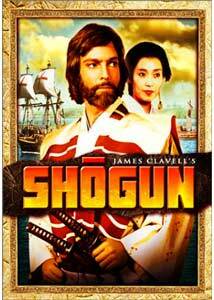 Shogun is an outstanding film and a worthy addition to any DVD collection for fans for historical epic adventure. It is both literate and, at times, lyrical, which is a tough achievement in the commercial environment of television.